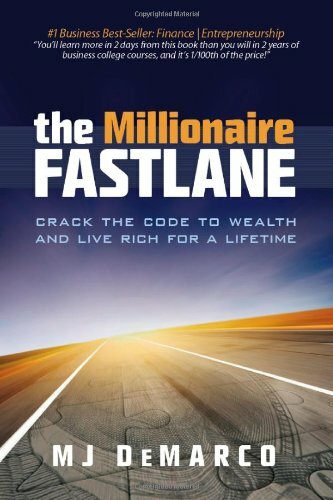 The Millionaire Fastlane: Crack the Code to Wealth and Live Rich for a Lifetime, is a book that inspires but also makes you feel terrible that you are not a multi-millionaire. MJ DeMarco, highlights the way to becoming wealthy through the concept of the slowlane and the fastlane. The slowlane is explained as getting a good job, saving, investing in the stock market, being careful with money – until the ‘payoff’ when you are old you’ll also be rich. The fastlane – the main theme of the book is about using finite time effectively to maximise the amount of money made. The first few chapters really repeat ‘Get rich slow’ and constant references to Lamborginies, therefore I did begin to wonder if the author was just a one-note bragger, critiquing a lifestyle without offering answers to achieve wealth. As I persisted through the authors logic becomes clearer and he offers a solution to the fastlane. With a preference to using time effectively to maximise money made, he is quite critical of people in business who are putting in more time than if they were employed. So businesses like owning a restaurant are considered slowlane, however owning a franchise of restaurants is fastlane. This is basically making a business through passive income and the author does a good job inspiring the reader on ways they too could make money on ventures that require small levels of maintenance. The author dismisses ‘money chasers’ the people who are drawn to ‘events’ selling the latest fad to get rich quick. It is clear that the author put in hardwork to start his business from the ground-up, learning about website design from books while doing menial jobs. There is a focus on providing a good customer service in business and acknowledges that entrepreneurs should be starting a business from the perspective of what can be offered to the customer and not what the owner wants. The Millionaire Fastlane is an interesting and inspiring read that covers all areas to start a fastlane business and is a great book to learn the mindset of an entrepreneur. I might have to check this book out. Sounds a little like the 50th Law. It has been awhile since I’ve read a book that I couldn’t put down. Definitely one of the most inspiring and motivating business books I have ever read. What should I bring to an Obstacle Race?